The new Kindle now comes with two radio options: for $139 you can get a Wi-Fi-only Kindle, while the Wi-Fi + unlimited 3G Kindle (contract-free from AT&T) will set you back $189, just like the old model. Amazon said it hopes to bring its e-reader to the mass market, after it sold "millions" of Kindles already (no exact figure there). The new Wi-Fi-only Kindle is $10 cheaper than Barnes & Noble's Nook counterpart, and the 3G version also cost $10 less than the 3G Nook. 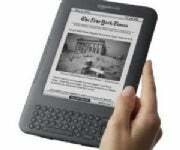 Amazon has streamlined the new Kindle, making it 21 percent smaller than its predecessor, according to the company. It sill has a 6-inch E-Ink display, and measures 7.5-by-4.8-by-.34 inches, as compared to the 8-by-5.3-.36 inches of the Kindle 2. The new design includes a more compact keyboard, with the numbers row removed (accessible via symbol key), clustered, smaller, navigation buttons on both sides, and a trimmed white space around the bezels. The new Kindle is also lighter, weighing in at 8.7 ounces (Kindle 2 weighs 10.2 ounces), compared to the Nook's 11.6 ounces for the Wi-Fi version, and 12.1 ounces for Wi-Fi+3G model. The evolved Kindle is also much faster now. Amazon says the page turns are 20 percent faster on the E-Ink display, and PCWorld's Melissa J Perenson's hands-on with the new e-reader reveals that navigation is "noticeably faster", as she could "breezily scroll through menu items," in an all-together "more zippy experience". The new Kindle can now store 4GB worth of e-books, around 3,500 books after the company's estimates. The Kindle 2 had only 2GB of internal memory, enough to store around 1,500 books. Software-wise, the new Kindle allows you to change line spacing and the font (regular, condensed, sans-serif), catching up with competitors in this area. You can also share excerpts of text on Facebook and Twitter, and see popular passages shared by friends, aggregated as 'popular highlights'. Finally, a quite basic browser makes it onto the new Kindle, which is why Amazon said it is still experimental. The browser is based on WebKit, the rendering engine powering Apple's Safari browser, Google's Chrome, and the mobile browsers on the iPhone and Android smartphones. Amazon says it has improved dramatically the battery life on the new Kindle. If you keep the wireless radios off, Amazon says you can get up to a month of battery life on a single charge, and 10 days with wireless on. The power improvements are said not to come from different battery technology on the new Kindle, but rather from software optimizations. White is so last year - finally, the Kindle now comes in two color choices. The classic white Kindle will be accompanied by a graphite model, like its big brother, the Kindle DX. What do you make of the new Kindle? Will you buy one over an iPad? Sound off in the comments. Follow Daniel ( @danielionescu ) and PCWorld ( @pcworld ) on Twitter.